Garage Sale Tips Or give it all to charity…whatever you prefer. Garage Sales are not always easy, but a little extra money never hurt anyone. If you’d prefer a charitable donation, make sure to get a receipt for a tax deduction. When dealing with online marketing you want to make sure the customers have an idea of what it is you are selling. When advertising on craigslist or other websites make sure you add a few pictures that will show what exactly you have for sale. Make sure that you structure the pictures correctly so that it looks appealing to the viewer. Make sure that all your items are priced with a sticker or perhaps a cost section. 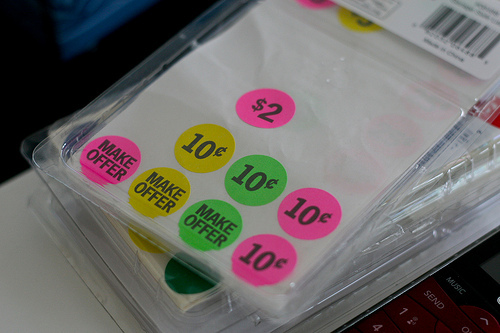 You may want to buy a few color coded stickers that you can easily assist your customers in identifying a price. Making sure that all your belongings are in categories is very important for the customers. You would much rather have customers who have some direction, than have them looking around aimlessly placing things where they can be overlooked. Making sections for blankets, books, toys, etc is a great way to stay organized and keep the consumers focused on the areas they are looking for. Know what you are trying to do with the items being sold during your garage sale. There are two kinds of garage sales, those that want to get ride of items and those that want to make money from what they have. If you are trying to get ride of things don’t be afraid to negotiate with the customers and give away free things in the process. This is a legal way of packing a bowl. Control yourselves now this isn’t Colorado, we are talking about packing your dishes. Many times customers have the misfortune of getting their valuable dishes broken during their relocation service. Believe it or not there is a science behind the packing of your items. We will share some tips on how to pack your bowls. Making sure that the box is secure is the second most important aspect in packing your bowls (only second to packing the bowls). Be sure that the tape that you use is strong, also beask your moving company if the tape is free of charge as tape can be very expensive. China Boxes are made stronger and of thicker cardboard to absorb travels shocks. In order to maximize the protection of your bowls make sure that you limit the amount of weight within the box. The lighter the better. Wrapping Paper that is used in protecting fragile items in conjunction with china boxes. When using the wrapping paper you want to be aware of the how much you use. Crumpling the paper works best. If you have a small child have them help you out. Children love crumpling paper. . Bubble wrap should be present when dealing with very fragile items. In conjunction with utilizing packing paper and the china boxes bubble wrap is a powerful tool to further secure your bowls. By placing bubble wrap at the bottom and the top of your box will reduce your dishes from getting travel damage in totality. After placing your bubble wrap at the bottom of the china box always start by packing the heaviest and largest bowl at the bottom of the box add crumpled paper to further secure the items. Pay the bowl on a stack of wrapping paper and begin to wrap it. Fold and tuck the ends around the bowl and repeat. After wrapping the bowl you want to make sure that your packing is consistent and organized. Evenly distributing the size of the bowls and making sure to always place your bowls on their side is key. Never stack the bowls. Place the bowls on their side and carefully line them up with the right amount of wrapping paper between them. Remember to always label your boxes so that you and the movers can find an easy way of getting to them. Always keep in mind that you should write “Fragile” on all china boxes. Be sure to help the environment by recycling the paper and boxes you use on the day of your moving service.